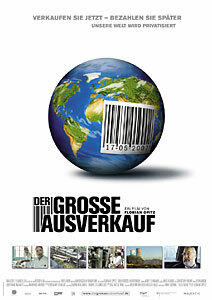 The Big Sellout (Der Grosse Ausverkauf) (Director: Florian Opitz, Germany, 2006): Beautifully shot on film, The Big Sellout is yet another strong political documentary, this one on the theme of privatization. Since privatization is a keystone of neoliberal economic policy all over the world, the film takes us to several different locales to see its effects on real people. What we discover is that the effort by multinational corporations to turn the necessities of life (healthcare, electricity, even water) into commodities is having a devastating effect on the people of the developing world. In the Philippines, Minda spends all of her time trying to scrape money together for dialysis treatments for her teenaged son. In South Africa, Bongani is part of a group of skilled activists who restore electrical service to those whose power has been cut off for non-payment. In Bolivia, Rosa is a grandmother who stood up to the faceless corporation that was attempting to privatize her city’s water supply. And in England, Simon the train driver details the breakup of British Rail and the decline of rail service in that country. In every case, privatization was the culprit, but to be fair, Opitz attempts to engage with the economists at the World Bank and the International Monetary Fund who often impose privatization as a precondition for lending to developing nations. Surprisingly for the director, he gets very little cooperation from these shadowy bodies, who are ostensibly required to be transparent and accountable to their member nations. The one economist he does interview is Joseph Stiglitz, former Chief Economist of the World Bank who now disagrees with the rush to privatize everything, and who has become an opponent of most of the economic policies of globalization. I was reminded when watching this film of several other strong anti-globalization documentaries of recent years, including The Take, The Corporation, and even The Yes Men. The Big Sellout adds some heartrending personal stories from several corners of the world, and it’s clear that privatization is really only helping those with too much money make even more of it. Without having to pay lip service to the democratic ideals of national governments, corporations are concerned with just one thing: the pursuit of profits. The profits may come, but the human costs should be tallied against them. The only weakness in the film may be that I was left wondering what I could possibly do, in my comfortable First World life, to combat this creeping sickness. The film’s German web site has some educational materials, so I hope these get translated for the English site soon. This entry was posted in Documentaries, Film Festivals, Hot Docs and tagged #hotdocs07, bolivia, Documentaries, economics, germany, globalization, Hot Docs, philippines, politics, privatization, southafrica, uk. Bookmark the permalink. This documentary challenges current economic orthodoxy in contending that the dogmatic claims of the international business establishment for neo-liberal development policies are not supported by modern economic science. More importantly, it dramatically demonstrates how the implementation of these policies is having disastrous consequences for millions of ordinary people around the globe. While national and international economic discourse is fixated on increasing efficiency and economic growth, The Big Sellout reminds us that there are faces behind the statistics. It raises serious questions about the neo-liberal credo that government best serves the public interest by becoming a servant to corporate interests. But brave individuals, like those showcased in this important new film, are standing up and demanding an alternative to the prevailing neo-liberal model, a model that the film shows to be as hollow as it is unsustainable. Similar to the protests occuring in El Salvador, the film documents how citizens in Cochabamba, Bolivia organized enormous protests in 2000, following the decision by the Bolivian government to sell the public water company to a private corporation, which would have made water cost-prohibitive to much of the population. The Big Sellout shows how ordinary people are fighting the neo-liberal commodification of basic public goods. Alicia, thanks for your comment but I don’t see the film (yet) on the California Newsreel site. As well, I suspect that the price will be quite high since you guys mostly do institutional exhibition. I suspect a regular DVD edition will be available at some point at a regular price.